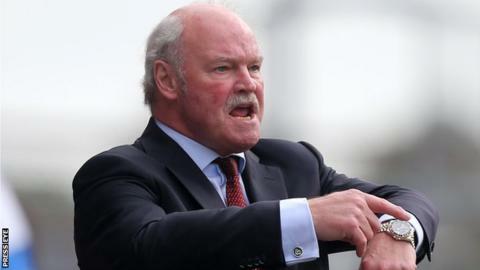 Ronnie McFall's tenure as Portadown manager looks to be approaching an end as the club are to initiate a process to find his successor, with his help. The timeframe for the transition is unclear but a statement from the club says they intend to begin the search for a new Shamrock Park boss "shortly". Europe's longest-serving manager has been in the post for almost 29 years but recent results have been poor. The Board say they are "very grateful to Ronnie for his offer of assistance". The Ports' disappointing run of form, including five straight defeats in all competitions, has seen them drop to seventh place in the Irish Premiership, leading to protests from a section of the club's supporters. Last week Portadown directors gave their backing for McFall to remain in charge "until the end of the season" but it remains to be seen whether that is still the case. "The Board fully support the current Manager, Ronnie McFall, who has been a tremendous servant to the Club, as Manager for almost 30 years," read the statement released on Thursday. "Ronnie has recognised that the time is approaching for the Board to be thinking about a possible successor, and has kindly offered to help in the process and facilitate a smooth transition. "The Board recognise that to succeed someone of Ronnie McFall's stature will be a daunting task, but we will try and ensure, to the best of our ability, that we identify a suitable person who can take the club forward and bring more of the success that the club's loyal fans have enjoyed and deserve. "It should be recognised that the Directors are also passionate supporters and we trust that the great PFC fan base will rally round, support the club, and we can all look forward to more successful days ahead." The statement also questioned "the motivation and desire" of some of the club's playing staff and announced the appointment of former Newry City manager Pat McGibbon to the backroom staff, "initially filling the vacancy left following the resignation of the club's physiotherapist Melissa Harrison". "We are sure that with his extensive playing and coaching experience, he will be an invaluable asset to the club," they said. McGibbon had been linked with the current managerial vacancy at Derry City and this week ruled himself out of contention to become the new boss of Glentoran, having been the initial favourite for the job.